Tired of looking for men's boots that have all the features you need, instead of just one or two? Well, we have good news for you! You can stop, because you just found the perfect pair. These Chippewa Men's 25408 Waterproof Insulated 9 Inch Super Loggers are the an ... (see full details) (see specifications) #CHP25408. Tired of looking for men's boots that have all the features you need, instead of just one or two? Well, we have good news for you! You can stop, because you just found the perfect pair. These Chippewa Men's 25408 Waterproof Insulated 9 Inch Super Loggers are the answer to all your sore feet-related prayers. Okay, so maybe you don't talk to the Big Dude in the sky about your sore feet. But we're pretty sure you've complained about it a time or two to someone. Prepare to be satisfied guys, because these tough Chippewa boots will stop your grumbling in its tracks. The bay apache waterproof brown leather uppers of this pair of waterproof boots will keep your feet in soft, supple comfort while keeping out the elements. Chippewa employs Goodyear leather storm Welt construction to attach the durable uppers to the rugged soles. Stitched rather than glued, Goodyear Welted footwear is much tougher and stronger than their competitors and deliver years of dependable wear. Speaking of soles, the Vibram Tacoma Yellow Plug outsoles on these USA-made boots provide outstanding traction on a variety of terrains. Oil- and slip-resistant, they keep you grounded the whole day through. Antique brass non-tarnishable hardware and heavy waxed sta-tied laces keep you firmly in this pair. The strong laces won't come untied unless you do so yourself. Now, let's talk safety. You may not have spoken to others about your insulated boots, but you may have requested to keep all your body parts in working order. Because black, frozen toes and feet are bad, this duo also features 400 grams of 3M Thinsulate Ultra insulation and Chip-A-Tex waterproof booties to keep those tootsies warm and dry. Much thinner and lighter than other insulating options, Thinsulate provides unbeatable cold-weather protection with less weight and bulk than other options. Okay, the moment you've been waiting for. Drum roll please...you want us to get right to the point? Ok, fine. To answer your question, yes, these leather boots are as comfortable as they are tough and protective. (Though that revelation would have been much more dramatic with a drum roll.) Lined in moisture-wicking Ruby Dri-Lex 2000, they deliver all-day comfortable wear by moving moisture and perspiration away from your feet. Removable and easy-cleaning orthotic Texon 460 waterproof insoles cushion each and every step you take for a soft, easy feel. Triple-ribbed steel shanks offer sturdy arch support to deliver improved stability and control. Even the midsoles features a fun combination of 4 iron rubber/6 iron robus to give your feet the right kind of support. We told you this pair of waterproof boots had it all. Except a drum roll. But we're not bitter about that. We're too excited about how wonderful you'll feel once you slip into these Chippewa Men's 25408 Waterproof Insulated 9-inch Super Brown Leather Logger Boots. They're made in America, too! Ordering doesn't require any sound effects. Just click on the cart, and we'll send them out. Years later from 1st review. These are the best boots I have ever put on. They take care of my feet. The other day I had worked all day in a pair of tennis shoes and had sore tired feet. An emergency happened that required me to be out sawing trees for hours. I put these boots on and they were great to my already tired feet. Although the insulation was a bit much for midsummer. I was reading my other review a guy had ask me to help him survey I thought ok cool we will ride around and walk a little. WE WERE IN THE MOUNTAINS WALKING ALL DAY!! New boots only a pair of thin, cheap, gym socks all day of mountain walking=no blisters ,WOW. Everyone's feet are different but these are the boots for me in fact I just purchased another pair. O'Yeah they look good too. You can wear them to church for a year then use them for work. I also feel and hope by purchasing them I am helping the good Ole USA. Chippewa Boots are still made to last!!! 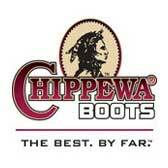 I've tried other brands but I come back to Chippewa every time. Try a pair and you will never buy any other brand! These boots will outlast every brand and still look good!! I am a research nut. Spent 2 months collecting facts. I wear a 12-1/2 Dbl Wide and WorkingPerson.Com spent a good collective 45 minutes on 4 seperate calls to answer my questions. Keep in mind I did what they suggested, coated 3 times with the Obenauf's Leather Care Cream Preservative. This cream is designed to keep PH levels were they belong, waterproofing but allowing leather to breath so it doesn't rot. Then sprayed 2 times with Obenauf's Water Shield. Getting one size more than I needed in addition to extra wide allows me to wear in the summer, wicking moisture out of the boot in summer with fantastic comfort. Oversizing also allowed me to double up on socks which were WigWam Socks. I can't state with words how great these boots and sock are. I have stood in 4 inches of water crossing creeks, got them filthy with wet TN clay. Not only can I be exposed to 0 degrees and be totally warm down to the toes, I can stay dry. I'm sure the Obenauf's treatment I did helped when it came time to hose them down and clean them up and they look brand new again. After drying, I treat them again to keep the leather supple and keep the cracks from showing up down the road. The last but most important fact I kept as a must, was my resolve to buy shoes and socks that were made in the U.S.A. Best Boot I have ever had on my feet and by far the best performer. They really are all that they say they are. Good Hunting. They went out of their way to help me find the best boot for my needs. This one turned out to be as great as they said it was. Chippewa Boots: Men's Waterproof Insulated 25408 USA-Made 9 Inch Work Boots is being added to your cart.